Ok, I know what you're all thinking..."It's only August! Why are you making Christmas cards already?" Well, for one, the new holiday catalog will be available to order from in just a little over a week! And, if you are anything like me, if you are planning to make your holiday cards this year, you will want some inspiration! Have you tried photopolymer yet? 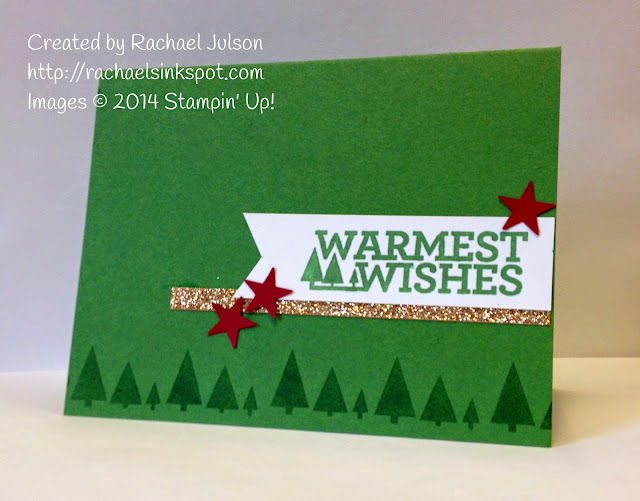 They are perfect for two-step stamping because you can see exactly where your image will be! No need for the stamp-a-ma-jig! See that tree border on the bottom of the card? It was easy to line up with these stamps! Have you received a copy of the holiday catalog yet? If you haven't and would like one (and don't already have a relationship with another demonstrator), I would be happy to send you one!